Lincoln Center stretched the definition of American Songbook with Reich and Sondheim: In Conversation and Performance, but the audience at Saturday night’s concert at the Appel Room was glad they did. 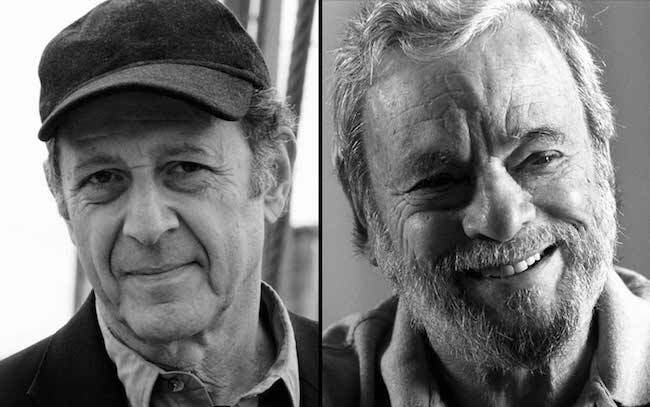 There’s no question that Stephen Sondheim and Steve Reich are titans of American composition, the former in the realm of musical theater, the latter in contemporary classical. Each man has a Pulitzer, a Gold Medal in Music from the American Academy of Arts and Letters, multiple Grammy Awards, the Praemium Imperiale… you get the idea. It turns out they are also friends and admirers of each other’s work, not to mention innovators and iconoclasts in their respective fields. The evening opened with Alexander Gemingani’s sensitive rendition of “Finishing the Hat” (from Sondheim’s Sunday in the Park With George) immediately followed by Anthony de Mare and Blair McMillen’s pulsing performance of Reich’s “Finishing the Hat – Two Pianos,” which reworks the melody and harmonies of Sondheim’s piece through the prism of Reich’s rhythmic experimentation. Then moderator John Schaefer took the stage with Reich and Sondheim. Schafer skillfully wove a conversation with the pair, punctuated by performances their music, that allowed each composer to draw his own connections between his and his counterpart’s work. We learned of Reich’s fondness for YouTube and Sondheim’s admiration of Radiohead, but mostly we learned of the men’s admiration of each other’s craft and inventiveness. And while it’s possible to single out moments like Kate Baldwin and Gemingani’s “Color and Light” (also from Sunday in the Park…) or Derek Johnson’s “Electric Counterpoint” (Reich’s virtuosic piece for live electric guitar in conversation with prerecorded guitar tracks) as highlights, the entire concert soared from start to finish. The concert ran nearly 40 minutes over its advertised time, largely because of the exuberance of both composers in conversation, and one was left with the sense they could have continued longer had the situation allowed. If you’re reading this with envy, you’ll be relieved to know that cameras were present, presumably capturing the event for a future Live at Lincoln Center broadcast.